The plaque commemorates the death of the Duke of Clarence who was the eldest son of Albert Edward, Prince of Wales (later King Edward VII) and Alexandra, Princess of Wales (later Queen Alexandra), and the grandson of the reigning monarch at the time, Queen Victoria. From the time of his birth, he was second in the line of succession to the throne, but he did not become king because he died before his father and his grandmother, the Queen. Monday Evening. At the City Hall this afternoon, the ex-mayor (Councillor Shoppee) unveiled a memorial tablet erected by the citizens, which bore the followlng inscription -" In memoriam HRH the Duke of Clarence and Avondale, obit January 14, 1892. 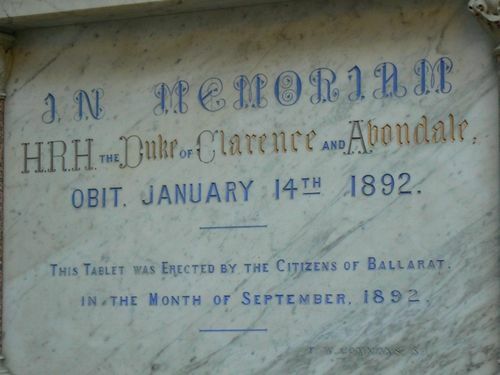 This tablet was erected by the citizens of Ballarat in the month of September 1892." It will be remembered that Mr Shoppee initiated a fund for the purpose of presenting a souvenir on the occasion of the marriage of the deceased Prince to the Princess May of Teck, but on the death of the Prince it was decided to devote the funds to the erection of a memorial tablet. Argus (Melbourne), 27 September 1892. H.R.H the Duke of Clarence and Avondale. This Tablet was erected by the Citizens of Ballarat. In the month of September 1892.